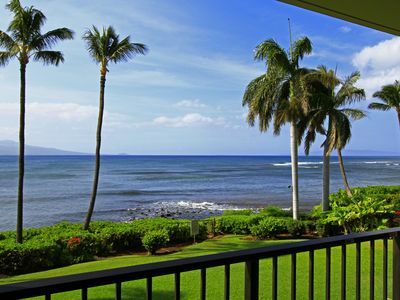 The views from this recently remodeled and upgraded(April-May, 2013) ground floor OCEANFRONT unit are spectacular, with the clear blue-green ocean vista and radiant sunsets over the islands of Lana'i and Moloka'i. 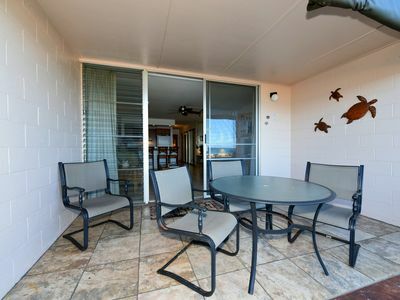 Step off your lanai and you are only 25 feet from the ocean where turtles feed in the rocks just steps from the Magic Beach! 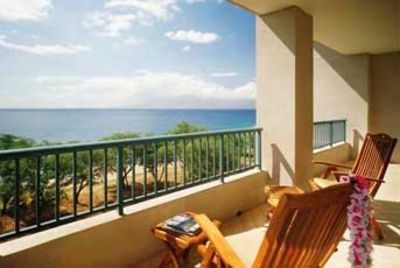 Located in the Kuleana resort with only seven 2-3 story buildings, enjoy the best of Hawaii with it’s tropical beauty and unsurpassed views. 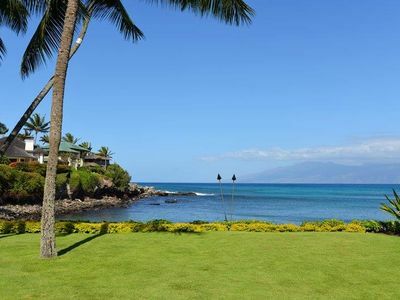 Kuleana is considered one of the most beautiful and impeccably maintained oceanfront properties on West Maui, offering luxurious living in a peaceful, serene setting. 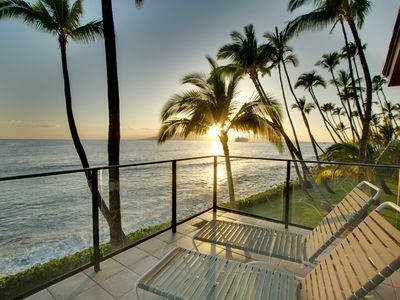 Seasonal humpback whale watching is available directly from our lanai using the high power binoculars provided in this unit (or take an even closer look with a Pacific Whale Foundation cruise from Lahaina harbor). 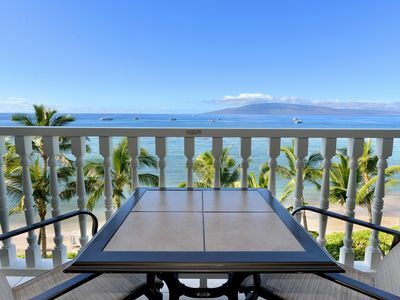 In addition to the multitude of sea turtles, other sea life such as dolphins, manta rays, eagle rays and monk seals can be seen right outside your door. 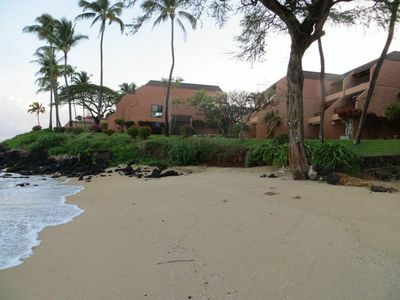 The property has two beaches and a sea ladder, all providing easy entry into the crystal clear ocean for snorkeling in the private snorkel cove, surfing, paddle boarding, boogie boarding (yes, the waves are good! 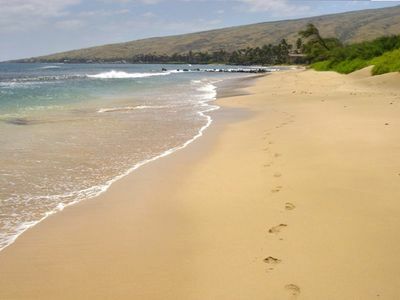 ), kayaking or simply relaxing in the water. 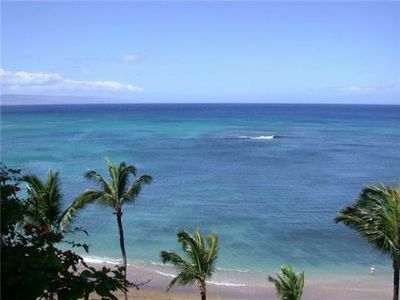 A coral reef exists straight out from the property, enhancing the snorkeling, surfing, kayaking, and boogie board activities. Fishing is also popular from the beaches and the ladder. 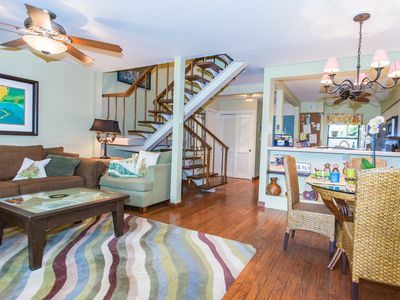 This unit was purchased in April, 2013 and completely remodeled as our second home and vacation rental in paradise. 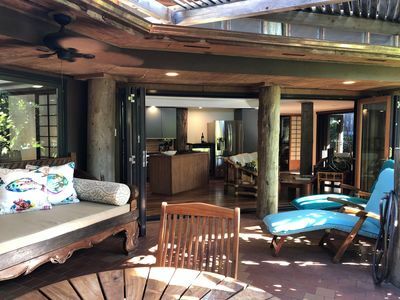 All new tropical furniture and decorations have been added to compliment the softly colored walls and insure complete submersion in the Hawaiian experience, with careful attention given to comfort, safety and storage. The top of the line plush firm Cal King bed in the bedroom provides relaxing comfort and support while being lulled to sleep by the distant sounds of the ocean. 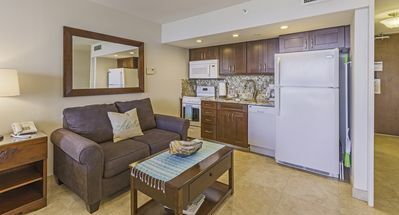 Although the ceiling fans in the livingroom and bedroom are usually sufficient to pull in the ocean breezes and keep the unit comfortable, the bedroom has a new air conditioner that's large enough to cool the entire 500+ sq ft interior space on those few days in the summer when it's hot and/or humid. The bedroom has ample storage for personal belongings, with a large mirrored closet, mirrored dresser and 15 inch high bedframe to allow storage of large suitcases and extra linens under the bed. The open and well lit bathroom has a large vanity with marble counter/sink and vanity to ceiling mirror, as well as an adjustable makeup mirror. The full size shower with rain glass doors has a built in seat, which together with the ADA compliant toilet provide ease of access for older occupants. The kitchen includes lots of counter space with the built-in island, as well as all the necessary appliances (fridge/freezer, stove/oven, microwave, dishwasher, garbage disposal, toaster, coffee maker, blender), glassware, dishes, silverware, cooking utensils, pots and pans, storage containers and non-perishable foodstuffs for those who want to prepare some of their meals themselves (or at least morning coffee and evening Pina Coladas). 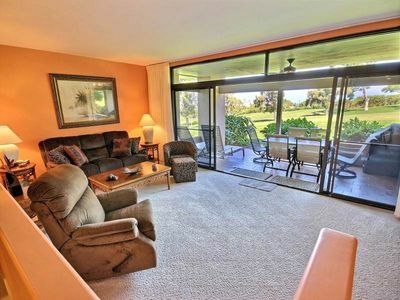 There is a small table with two chairs next to the kitchen for inside dining (or working on puzzles or other table based games), but we enjoy most of our meals on the patio table and four swivel/rocker chairs on the lanai. The livingroom has a comfortable queen size sofa sleeper (with 6 inch thick mattress), two swivel rocker easy chairs, coffee table and end tables with adjustable lighting, as well as an entertainment center with an adjustable 40 inch wall mounted HDTV (with premium HDTV programming, WiFi and streaming from Netflix, Amazon, Hulu, etc). 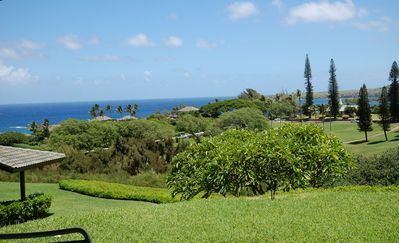 The grounds, nearly 4 acres in size, are second to none on West Maui. They contain a myriad of meticulously manicured, lavish vegetation along with paths on which to stroll the property. There is a large, heat-controlled pool to sun, swim, and relax. 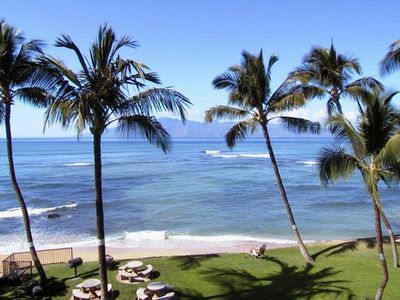 Barbeques reside at the ocean’s edge, providing an unsurpassed setting for cooking while watching the sunset. There are a multitude of on-site activities to enjoy, including tennis and shuffleboard and ping pong. 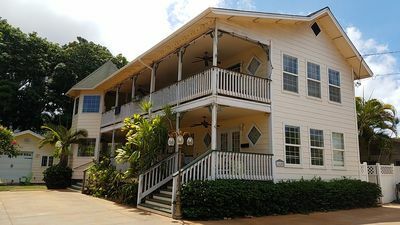 The resort lobby has extensive library for your reading pleasure, as well as a concierge for booking your luaus and sightseeing trips. 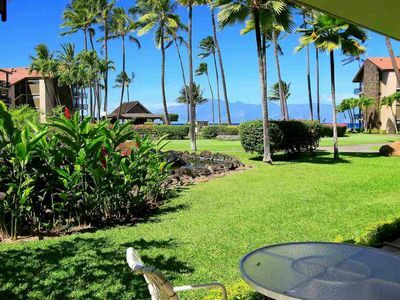 Why pay the high prices for a room in the popular hotels in Kaanapali, Kapalua or Wailea unless you prefer distant ocean views, crowded beaches and eating every meal at expensive restaurants. 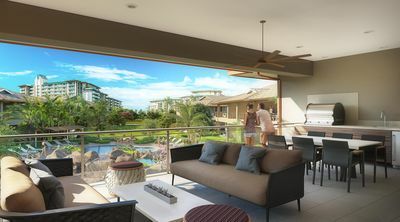 Our luxurious Kuleana condo is ideal for anyone who wants to control their budget, activities and privacy to suit their own tastes. 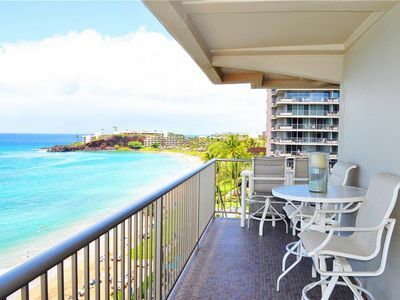 NOTE 1: IF THIS CONDO IS NOT AVAILABLE FOR THE DATES YOU WANT, PLEASE TRY VRBO 735379, WHICH IS A THIRD/TOP FLOOR UNIT RIGHT ABOVE THIS ONE (718 KULEANA). 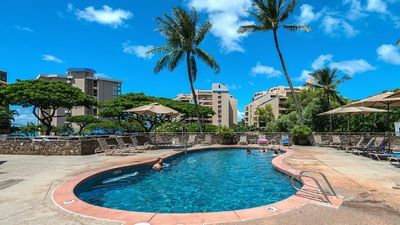 NOTE 2: IF YOU ARE LOOKING FOR 2 CONDOS FOR EXTENDED FAMILIES, WE OWN BOTH 702 AND 718 KULEANA WHICH CAN BE RENTED TOGETHER IF AVAILABLE. Pure Luxury – Upgraded Like No Other Condo – Spectacular! 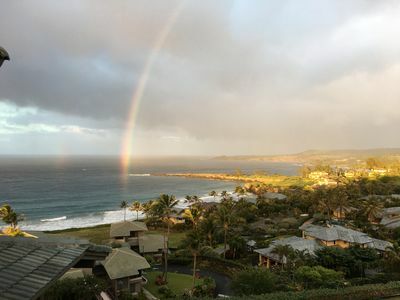 Kapalua Ridge Villa Ocean Views From Every Room! 11th floor Studio with Ocean View!